The E28 BMW 528e (and the eta-engined E30 cars) were always considered the poor relations of the more sporty 325i, 533i and 535i cars. But while the eta engines are not particularly rev-happy, they are starting to gain appreciation for their low-end torque which, in the world of 65mph speed limits, and urban driving, matters more than horsepower. On the bright side, the eta-powered cars were also found to have their best fuel efficiency ratings when drivers held the throttle wide open when accelerating from a stop, so if you like flooring it, here’s an excuse to do so. 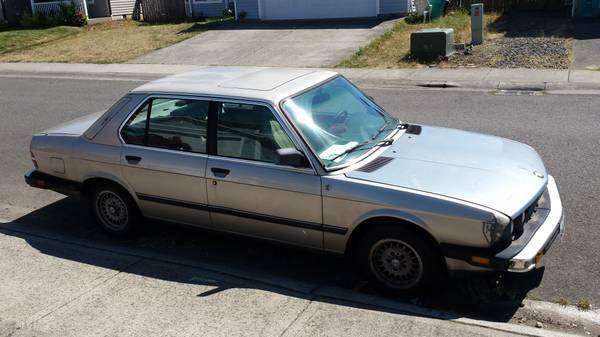 Check out this 1987 BMW 528e for sale for $800 in Vancouver, WA. Imagine that in 1987, someone was excited to bring home this entry-luxury sedan, and paid a substantial amount of money for the pleasure. Now, it’s eight hundred bucks, and it’s got the lines on its face and folds on its hands to show for it. That said, the overall impression is that of a straight car, and a thorough cleaning/detail job would probably go a long way to making it look and feel better. The car is said to have “small issues” as well as a rebuilt title, but the engine is said to pull strongly. The interior has definitely seen better days, with checking on the seats and some kind of wiring jumble to the left of the steering wheel. However, it’s a pleasure to see a manual shifter, as most of these cars were saddled with automatic transmissions, which probably didn’t help their reputation for being slow. The angle of the driver’s seat is a little funny, but on the bright side, it’ll be easier to get out of the car. The rear seat is hidden under a seat cover, so expect the worst back there. 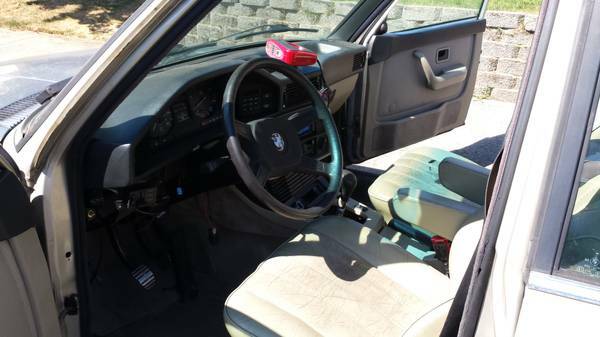 The dash looks pretty decent, and the sunroof even looks like it’s operable. If you’re looking for a fun beater (or perhaps a Lemons racer) this might be a great choice. This entry was posted on August 28, 2014 at 10:50 am and is filed under Feature. You can follow any responses to this entry through the RSS 2.0 feed. You can leave a response, or trackback from your own site. Speaking of cars that have depreciated; I watched a 2003 M-B S430 in beautiful shape pull a high bid of $4000 last night. I would’ve bought it myself if I had the duckets available.